As most of you know, I love to read and I have pretty eclectic taste. What I love even more is when I can get some great books for free. So, I can't wait to get this series for free on Amazon. 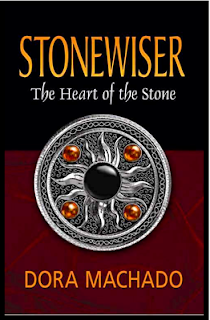 For the first time ever, Dora Machado's entire Stonewiser series is available in a free Kindle Giveaway, including the complete award-winning trilogy, Stonewiser: the Heart of the Stone, Stonewiser: The Call of the Stone and Stonewiser: The Lament of the Stone. These will be available for free from Saturday August 31 to September 2 and then again September 6 and 7th. Sariah's reward for revealing the stone truth: a death sentence. The executioners have arrived and Sariah, the most powerful and controversial stonewiser of her generation, has been judged and condemned to death. For the last few months, Sariah has been hiding in the Rotten Domain, trying to find the elusive tale capable of uniting a divided people teetering on the brink of a catastrophic war. As she is dragged to the nets, where an eel rave has been stirred to maximize her execution's gruesome spectacle, Sariah knows she cannot escape her sentence. She is guilty of the crimes for which she's been condemned and no one, not even Kael, the Domain's foremost rebel leader, can save her from the executioners' righteous justice. But Kael is more than just a formidable warrior; he is also a cunning strategist and Sariah's steadfast lover. Risking all he has, he bargains with the greedy executioners, bribing them into delaying Sariah's execution, buying her precious time and a last chance to realize the mysterious legacy that the stones have imposed on her. The agreement is hardly a reprieve. It encourages a mob to hunt Sariah for ransom, banishing her from the Rotten Domain and imposing heavy fines on anyone who tries to help her. Worse, it requires her to wear an irremovable, mysterious bracelet. If she doesn't return to the executioners with the tale in hand when the allotted time expires, Kael and his kin will be ruined and the bracelet will kill her. "Do you know why the stones grieve?" the woman said to Kael. "Not for a soul, I'll tell you that much. The stones don't grieve for the passing of a lowly woman or the madness of a smitten man. They don't mourn death, or lost love, or broken dreams, or loneliness or despair. Yet you will make them wail. For you, the stones will weep." In their most perilous adventure yet, Sariah, the rogue stonewiser who stunned the world by discovering lies in the stones and defying the all-powerful Guild, and Kael, the rebel leader who against all odds loves her, must find a stolen child, the only one capable of setting rule upon chaos, preserving the future of stonewising, and defeating the rot ravaging the land. The stakes couldn't be higher. The coveted child they seek is said to be an abomination. He is also their son. It's a daunting challenge. Their child is in the hands of a deceitful enemy who has fled to a mysterious ruler, a rival deity with unfathomable powers pledged to destroy the goddess and eradicate stonewising from the world. Worse yet, the land is engulfed in strife, the rot is spreading faster than ever, and Kael is haunted by a malevolent curse compelling him to kill the woman he loves. Dora Machado is the award winning author of the Stonewiser series and her newest novel, The Curse Giver, from Twilight Times Books, available July 2013. She is one of the few Latinas exploring her heritage and her world through the epic fantasy genre today. She holds a master's degree in business administration and graduated Phi Beta Kappa from Georgetown University. She was born in Michigan and grew up in the Dominican Republic, where she developed a bilingual fascination for writing, a love for history, and a taste for Merengue. After a lifetime of straddling such compelling but different worlds, fantasy is a natural fit to her stories. She enjoys long walks, traveling, and connecting with the amazing readers who share in her mind's adventures. She lives in Florida with her indulging husband and three very opinionated cats. Subscribe to her blog at http://www.doramachado.com/blog/ , sign up for her newsletter at http://doramachado.com/newsletter.php and follow her on Facebook and Twitter. 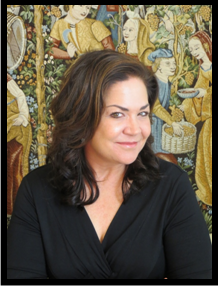 Dora Machado is the award winning author of the Stonewiser trilogy and her newest novel, The Curse Giver. She is one of the few Latinas exploring her heritage and her world through the epic fantasy genre today. 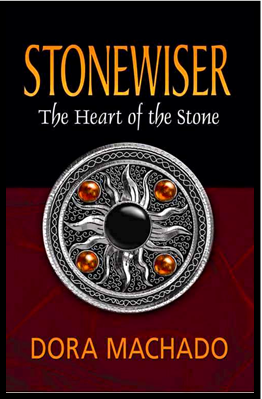 Her first novel, Stonewiser: The Heart of the Stone, won the 2009 Benjamin Franklin award for best debut novel. 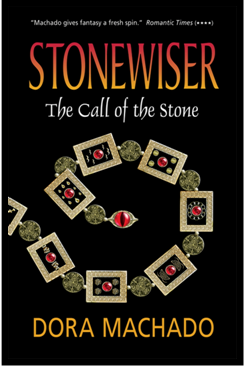 Her second novel, Stonewiser: The Call of the Stone, won the 2010 Independent Publishers Book Award's (IPPY) Gold Medal for Best Science Fiction/Fantasy book of the year. 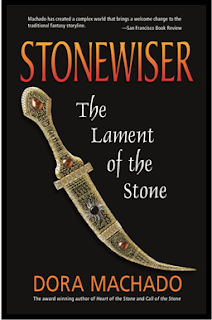 Her third novel, Stonewiser: The Lament of the Stone, won the 2012 Independent Publishers Book Award's (IPPY) Silver Medal for Best Science Fiction/Fantasy book of the year. All three novels were finalists in ForeWord Magazine's Book of the Year Award in the Science Fiction and Fantasy Category. Her latest novel, The Curse Giver from Twilight Times Books is available July 2013.